Instant downloads of all 942 LitChart PDFs (including The Raven). Welcome to the LitCharts study guide on Edgar Allan Poe's The Raven. Created by the original team behind SparkNotes, LitCharts are the world's best literature guides. A concise biography of Edgar Allan Poe plus historical and literary context for The Raven. A quick-reference summary: The Raven on a single page. In-depth summary and analysis of every of The Raven. Visual theme-tracking, too. Explanations, analysis, and visualizations of The Raven's themes. The Raven's important quotes, sortable by theme, character, or . Description, analysis, and timelines for The Raven's characters. Explanations of The Raven's symbols, and tracking of where they appear. An interactive data visualization of The Raven's plot and themes. Poe was orphaned at a young age and grew up fostered by the wealthy Allan family in Virginia. After dropping out of university and the army, he became one of the first writers of the time to make a living from publishing his stories and criticism. Possibly his best-known work, “The Raven,” published in 1845, won him considerable fame and success. But he had much financial and mental difficulty throughout his life, particularly after the death of his wife Virginia. Poe’s death in 1849 was a much debated tragedy – alcohol, suicide, tuberculosis 3and many other things have been attributed as causes. 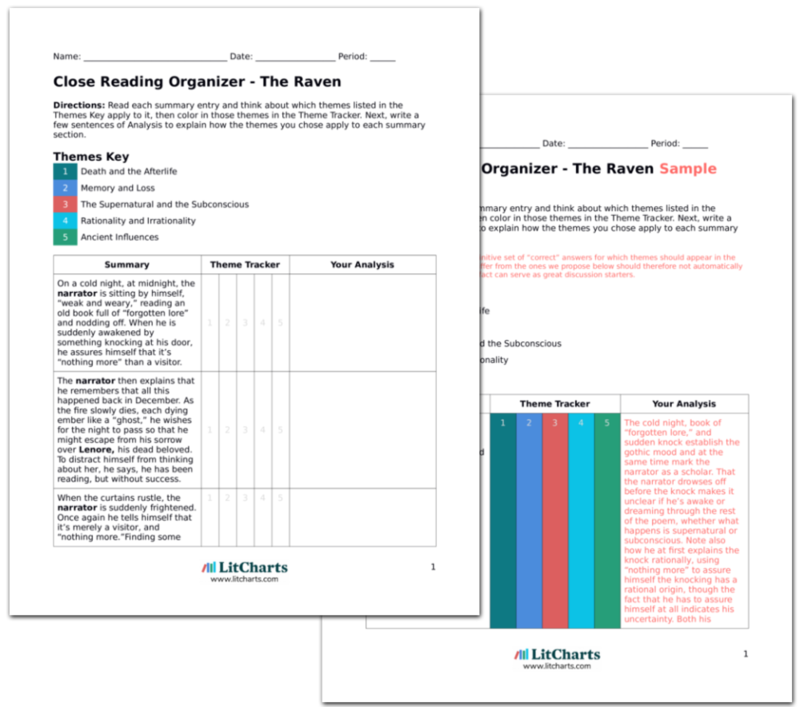 Get the entire The Raven LitChart as a printable PDF. “The Raven” is an example of Gothic literature. Originating in 18th century England, the Gothic typically includes elements of the supernatural, horror, doomed romance and melodrama. Like “The Raven,” Gothic works like Wuthering Heights by Emily Brontë and Jane Eyre by Charlotte Brontë find their characters in dreary isolation, struggling with intense passions while surrounded by spooky, otherworldly influences that are often connected both with the supernatural and the subconsciousness of the characters. Climax:As the narrator tells us at the conclusion of the poem, the Raven remains in his home, possibly forever. Point of View:The poem is told from the point of view of the narrator. Archrival. Poe and literary critic Rufus Griswold were often in literary conflict. Griswold had the last word, writing an obituary of Poe that portrayed the author as an insane alcoholic. Harsh critic. Poe had a reputation for condemning other writers in his reviews — notably, Henry Wadsworth Longfellow, whom Poe accused of being a plagiarist. Gersten, Jennifer. "The Raven." LitCharts. LitCharts LLC, 26 Nov 2016. Web. 18 Apr 2019. Gersten, Jennifer. "The Raven." LitCharts LLC, November 26, 2016. Retrieved April 18, 2019. https://www.litcharts.com/lit/the-raven.